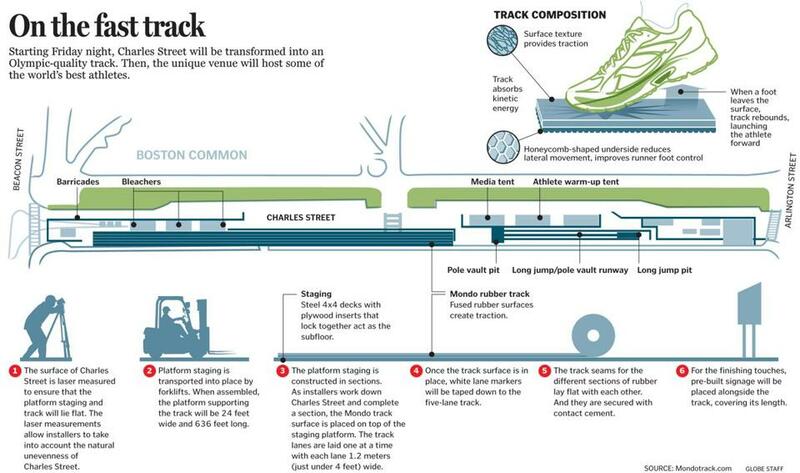 A rendering of the temporary track to be used on Charles Street for the adidas Boston Boost Games. 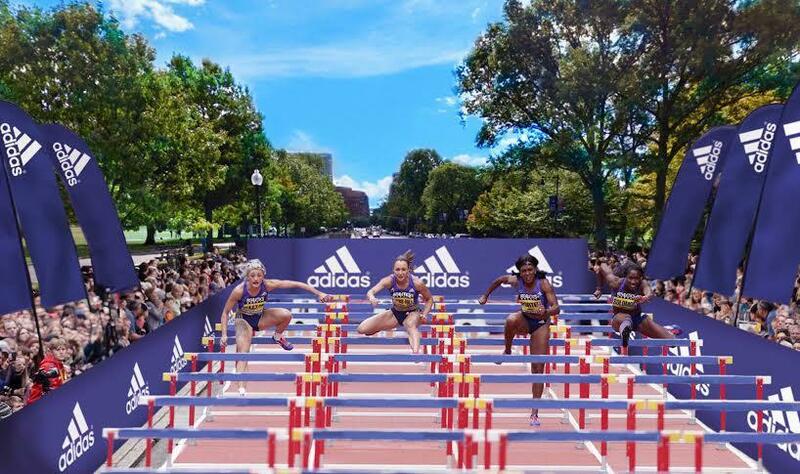 Before world-class sprinters and hurdlers speed down Charles Street next Saturday, the organizers behind the adidas Boost Boston Games will be on the clock. They will transform the broad, bumpy stretch of asphalt between Boston Common and the Public Garden into an Olympic-quality, 180-meter-long track. And they will do it in roughly 12 hours with the contents of two shipping containers sent from Italy. The build will start at 9 p.m. on Friday with a collection of steel support structures, plywood inserts, and 90 rolls of rubber track each measuring one lane (or about 4 feet wide) and 10 meters long. The installation crew will take laser measurements of Charles Street and its uneven surface, then construct a level staging platform with the steel and plywood. Strips of rubber Mondotrack will be laid flat upon the staging platform and secured with contact cement. The Mondotrack running surface will be identical to what athletes will compete on during the Rio Olympics. If all goes as planned, the installation crew will be taping down lane lines at 9 a.m. on Saturday, well before the meet starts at 3:45 p.m. with the girls’ youth 100-meter dash. The finished product will be a considerable logistical achievement and a certified, records-eligible track. It will also create a track venue unlike any seen in the United States. A world-class meet will be held in June on Charles Street between the Common and Public Garden. Global Athletics & Marketing organized a pole vault exhibition in Herald Square in New York, but that was a one-lane event in 2014. And street meets held in Manchester, England, and Newcastle, England, provided the inspiration for Boston. Meet organizers hope the unique location of the street meet draws track fans, families with young track athletes, and casually curious onlookers who stop and watch elite track runners for the first time. Given the popularity of the elite international indoor track meet held annually at the Reggie Lewis Center, which fills up with 3,000 spectators for the event, Wetmore hopes a few thousand will watch the adidas Boost Boston Games. Mayor Martin J. Walsh plans to be among the crowd. The street meet went from an initial pitch meeting with the mayor and his staff to reality in a few months. It helped that meet organizers were Boston-based and experienced with staging big, international meets, that adidas signed on as sponsor, that the track build would be timed for minimal disruption of traffic and business, that Charles Street and the people who work and live around the area are accustomed to occasional running-related disruptions because of the annual BAA 5K, BAA 10K, and Tufts 10K for Women. It also helped that the Rio Olympics will take place in August, ramping up the appetite for track and field. And like Big Air at Fenway Park in February, the street meet is an opportunity to market track and field in a different way and introduce it to a new audience. If successful, the adidas Boost Boston Games may create a model for how the US brings track to the masses. After all, it’s a country with fewer than a dozen stadiums where world-class meets can take place. The challenge with creating the Charles Street venue will be more about scheduling than building. From the moment the installation crew unloads the two shipping containers worth of track material to the tear-down phase, a lot will happen within a small window. The track should be gone shortly before midnight on Saturday. That means months of preparation will come down to roughly 27 hours of precisely scheduled action, especially because the elite portion of the street meet — the men’s and women’s 100, the men’s 110 hurdles and women’s 100 hurdles, the women’s pole vault, and men’s long jump — will be broadcast live on NBC Sports Network. In the future, Wetmore hopes to grow the street meet, building on what he and his staff learn from staging the event this year. 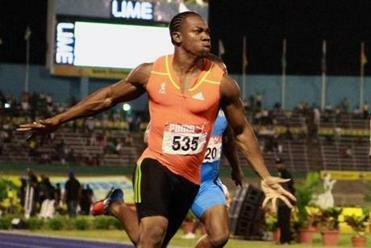 He would like to add races, and maybe include the shot put, too.